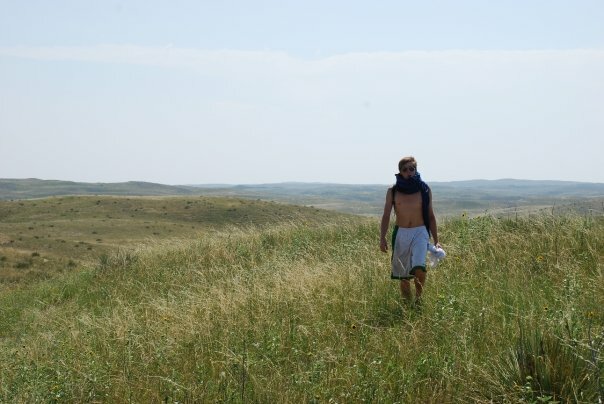 Hiking on a summer day in the Nebraska Sandhills. Photo by Greg Wagner. “There is delight in the hardy life of the open.” – Theodore Roosevelt. My, my we are all are so reliant on the ‘grid’ of modern technology. With computers, the Internet, Smart phones, IPads and even the computerized sensors and chips that make our motor vehicles run, every move we make it seems cannot be done without entering the technological sphere. Oh, and let’s not forget about the convenience of electricity either. All of this high-tech gadgetry is a positive thing in our daily lives, right? But wouldn’t it be nice to disconnect and take a break from it all? Wouldn’t it be nice to head to an isolated, backcountry location with no public utilities just for a while to cleanse your mind and gain a better appreciation for what we have in this world? I certainly think so. Primitive tent campsite in the Nebraska Sandhills. Photo by Greg Wagner. One of the best ways to unplug from this digital-driven society is to journey into what I call “true wilderness.” I mean a large, expansive place where the land is in its mostly natural state and human impact has been or is minimal. And, I have such a place for you. It is a place of seemingly endless wilderness where a person can trade modern conveniences for simple joys and meaningful outdoor experiences. It is a place where the wind nearly always blows and where quiet moments, wide-open skies, numerous wildlife species and pastoral scenes await! 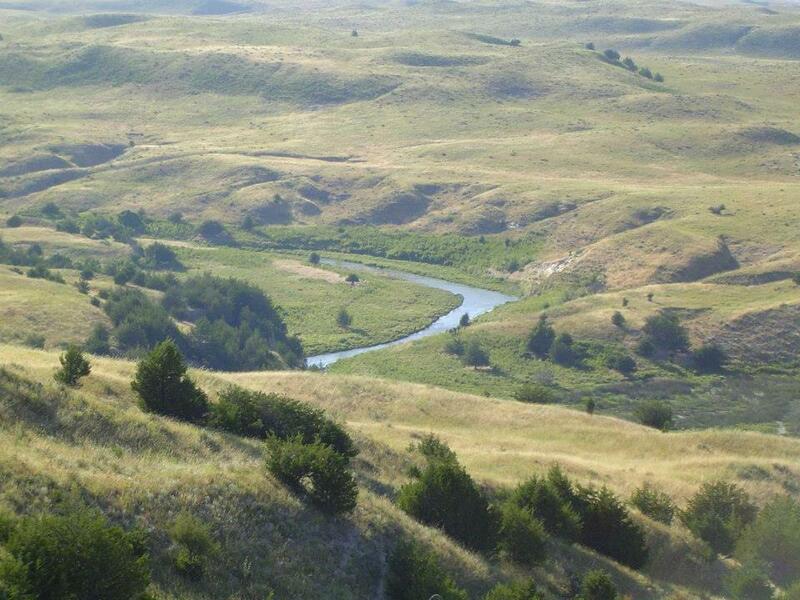 The Upper Snake River valley in Nebraska’s Cherry County in the heart of the Sandhills. Photo by Greg Wagner. 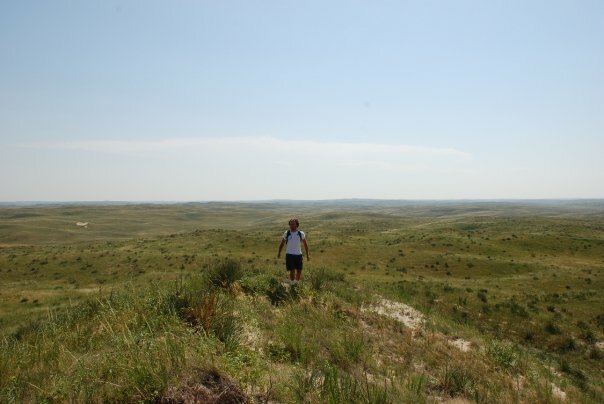 Stretching 265 miles across Nebraska and encompassing over 19,000 square-miles of grass-covered sand dunes, this place is called the Nebraska Sandhills. It is about the size of West Virginia! 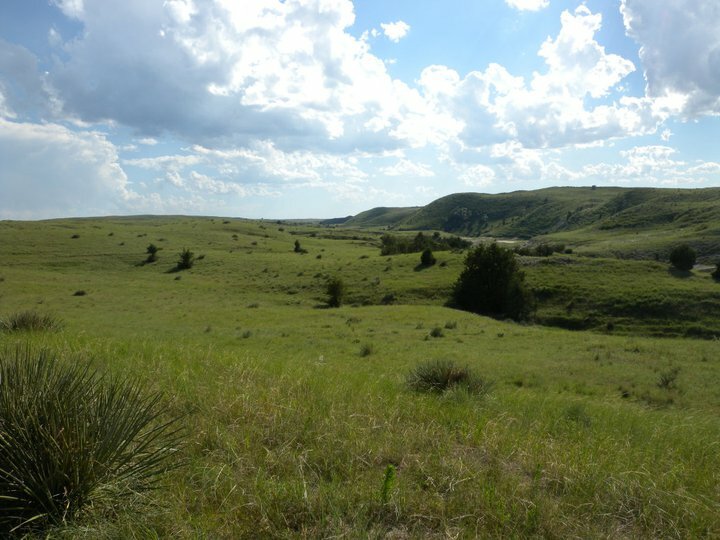 This unique, Great Plains ecoregion possesses mixed-grass prairie on grass-stabilized sand dunes in north-central Nebraska, covering just over one quarter of the state. With dunes that are as high as 400 feet, as long as 20 miles, and slopes as steep as 25 percent, the Sandhills constitute the largest sand dune formations in the Western Hemisphere plus one of the largest grass-stabilized dune regions on earth! 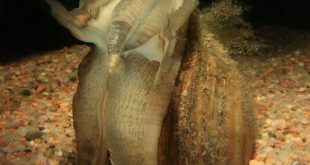 The entire ecoregion sits atop the massive Ogallala Aquifer; forming shallow wetlands and lakes as well as rivers and creeks in low-lying valleys between the dunes giving rise to sporadic growth of shrubs and trees. Another view of the Upper Snake River valley in Nebraska’s Cherry County in the Sandhills. Photo by Greg Wagner. For one reason or another, it seems this picturesque area and its friendly people have escaped today’s treadmill. The Nebraska Sandhills. Photo by Greg Wagner. Of all places in Nebraska, the Sandhills comes closest to being just about like it always was. The difference is that this broad, 12.75 million acre area which is roughly 95 percent rangeland, is now cattle country where wild bison once grazed. Interestingly, good habitat for a herd of Black Angus is about the same as good habitat for wildlife. 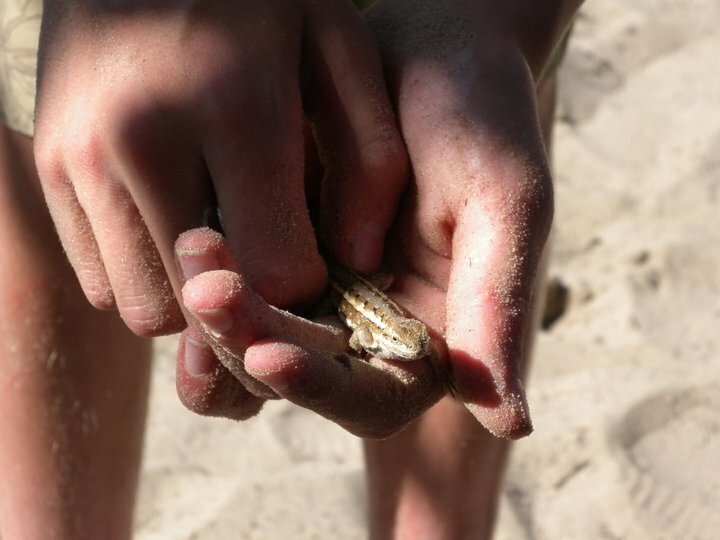 This is a northern prairie lizard, a Sandhills reptile. Photo by Greg Wagner. 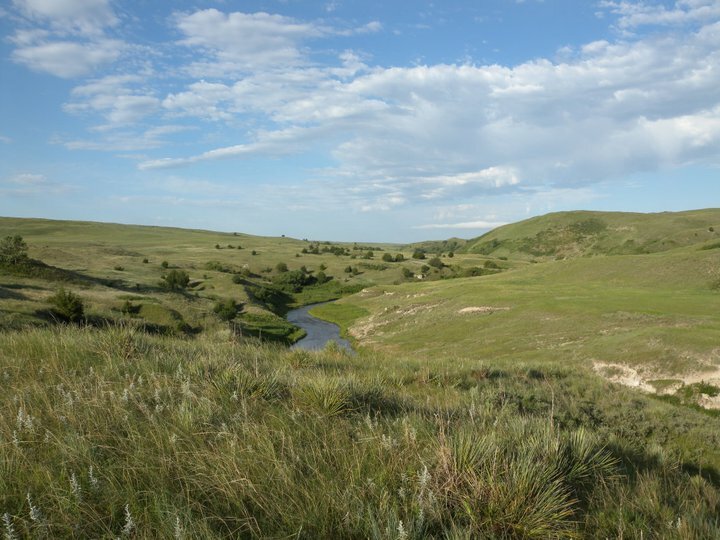 Like most of Nebraska, the majority of the land in the Sandhills is privately owned. Permission to travel on private ranches has to be acquired and is not out of the realm of impossibility. Thorough homework definitely needs to be done though to find out detailed information regarding land ownership. 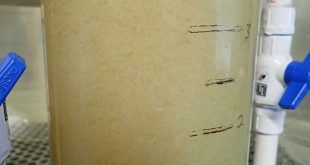 You must make contact with ranch owners well in advance of your intended trip to obtain permission. When visiting with them, be polite and respectful, get to know them and their ground rules, offer a gift of gratitude (e.g. fresh sweet corn), have a plan, and stress that extreme caution will be observed with campfires, cattle and cattle fences. You will discover that many of these nice folks won’t mind a few of you looking to hike, study nature, camp, fish and possibly canoe for several days. 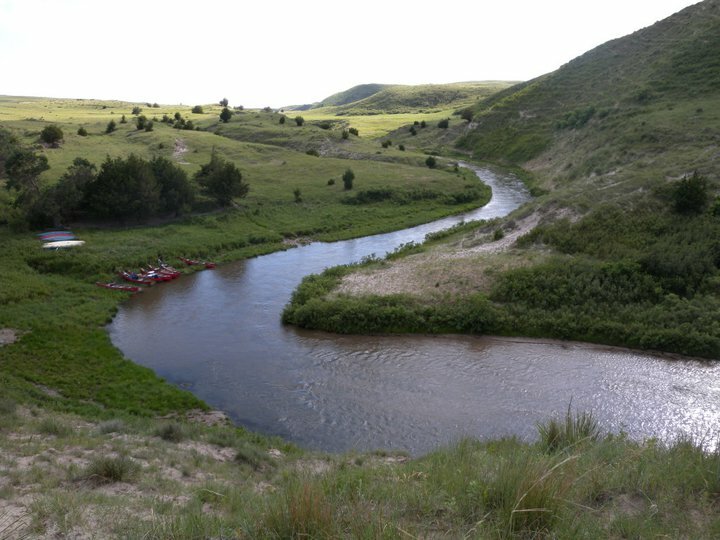 Canoes parked along a bank of Cherry County’s Upper Snake River in the Nebraska Sandhills. Photo by Greg Wagner. An angler fishes for brown and rainbow trout in the waters of the Upper Snake River in Cherry County in the Nebraska Sandhills. Photo by Greg Wagner. The good news in the Sandhills is that there are a number of lands open to public outdoor recreation. 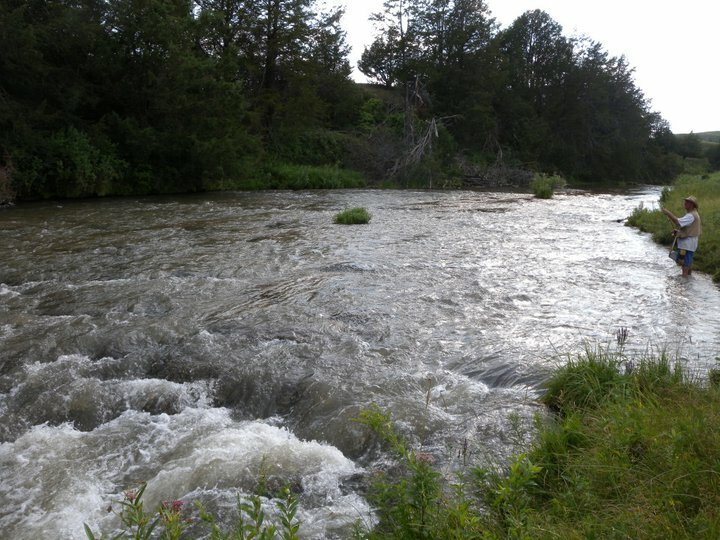 Two remote, massive USDA Forest Service properties for dispersed camping are available — the 90,000-acre Nebraska National Forest/Bessey Ranger District near Halsey and the 116,000-acre Samuel R. McKelvie National Forest near Valentine. If you’re wondering, dispersed camping means camping anywhere in the National Forest system outside of of a designated campground. 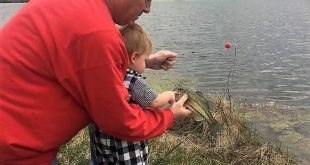 For this kind of camping, according to the Forest Service, you’ll need to check on the fire danger level, bring your own water or purify water from windmills, lakes, streams or springs. Make your camp at least 100 feet from all water sources. And, dig a hole at least six inches deep for disposal of your human waste. You should also file a plan, telling officials where you are going and when you will be back. Be sure to check other guidelines and regulations for this type of camping on National Forest lands. 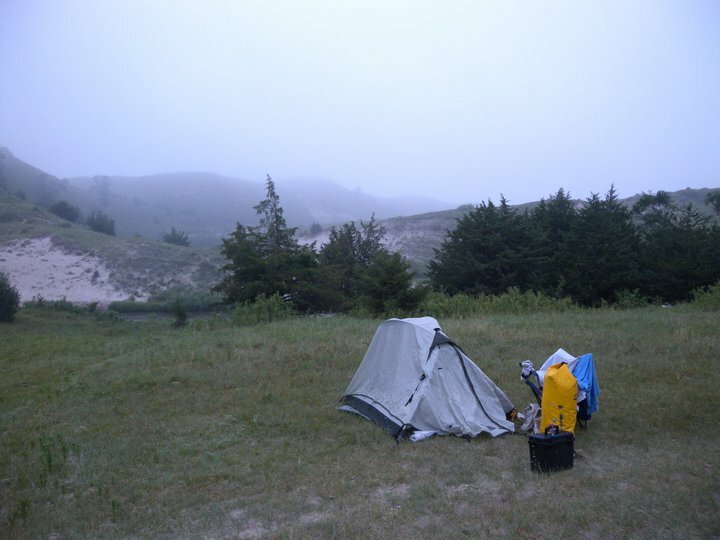 Be prepared for a remote, rugged outdoor adventure backpacking in the dunes of the Nebraska Sandhills. Photo by Greg Wagner. No matter where you end up camping or how long you stay, always leave no trace of being there! That means when you venture away from your campsite, there should be no trace that you were ever there: no new fire rings, no trash, no mess. Take only photographs and leave only footprints! Enjoy going off the grid for a short stay in the Nebraska Sandhills! 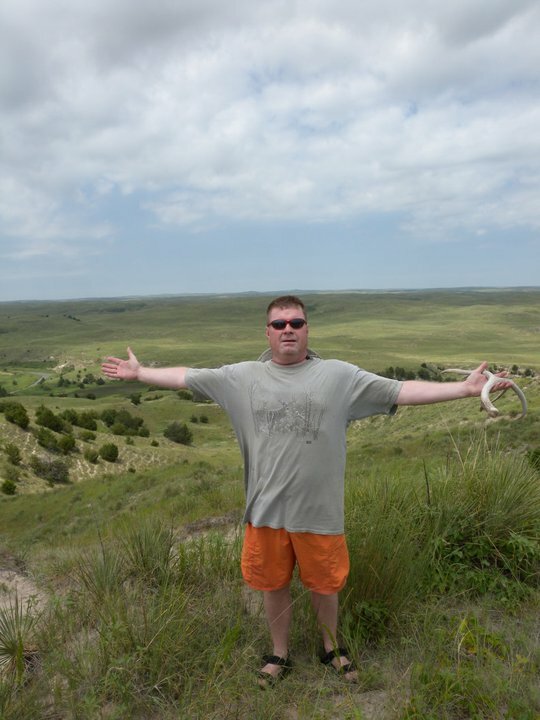 Your blogger standing on a high hill holding a shed mule deer antler in the north-central Nebraska Sandhills ecoregion. 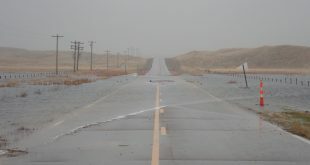 Photo by Zach Wagner.